While I started writing this review soon after I got the iOptron, for some reason it was left unfinished and unpublished. So I am finishing it up now, a year after getting the iOptron, having had more experience with it. In the meantime, iOptron has upgraded the electronics of the mount and renamed it to CEM25 (although, at least in Europe, it is not easy to get the updated mount yet) and also I got a new HEQ5 Pro for my vacation home (since I found an amazing deal on it), so I can do an even better comparison with it. The first think you will notice is the different design compared to the “classic” german equatorial mounts where the counterweights are on the declination axis. 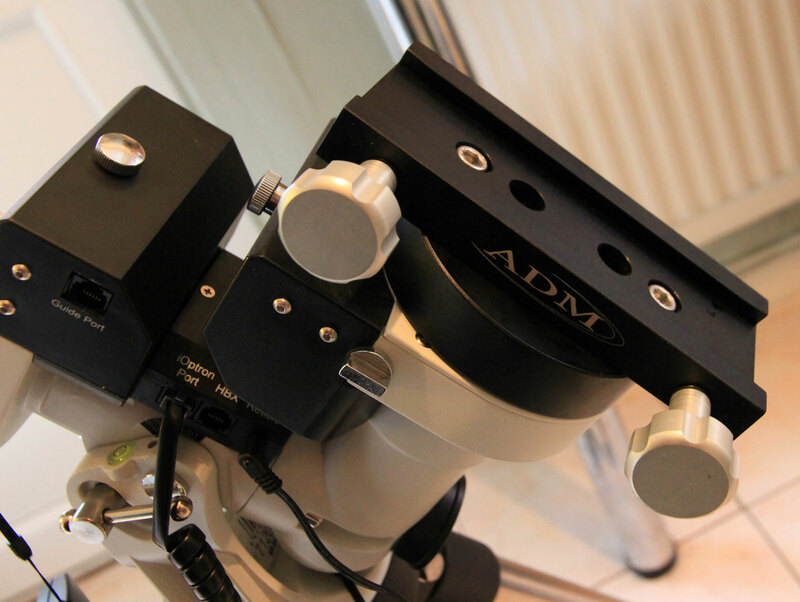 The second thing you will notice is that for a rated capacity of 12kg (27lb), the mount is tiny and extremely light. In fact, the mount head is just 4.7kg (10.4lb) and if you add the standard tripod at 5kg it is still lighter than just the head of other popular mounts with relatively similar specs/capacity. While there is a heavy-duty 2-inch leg tripod available as an option, the standard 1.5-inch leg tripod makes the perfect match with the mount if portability is a concern. It is light and relatively short, so when the legs are contracted you really don’t need to go through the whole dismantling of the accessory tray etc – leave the mount fully assembled with the legs spread and it will still go through any door and fit into any car as it is, saving you a lot of assembly time! 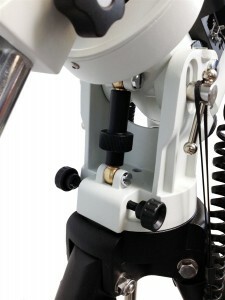 After having used manual mounts and older computerized mounts, the small iOptron can be called a “delight” overall. As I stressed, it is very light and easy to handle. After you install the accessory tray and the mount head, you see that if you don’t extend the legs you can easily store it assembled as it is and even put it in the care like that (which is what I do). There is a bubble level on the mount, however the first time you use it you’d want to find the “zero point” for the RA & Dec axis (a video with instructions can be found here) – it is important that the polar scope reticle in the RA axis is exactly upright. The saddle is one of the weak points of the mount in my opinion. While it is a nice spring-loaded design and will not mark your dovetails, for some reason it has a strange “ridge” near the base where a dovetail might catch against giving you the impression it is safe, when it is not. Ok, if you know it you can be careful and avoid problems, but I have no idea why there is such a silly design flaw in an otherwise very well thought-out mount. In any case, the ADM saddle upgrade is the one upgrade I recommend, as apart from fixing that flaw it is longer and stronger giving you some extra sturdiness. The clutch mechanism is a bit strange. You have a screw that controls a spring mesh, so you loosen that then release the clutch and you have both axes rotating completely freely (good for balancing), then you engage the clutch and tighten the screw a bit so that the gears engage (being careful not to over-tighten). While it is a bit awkward to use, it seems to work well, avoiding e.g. backlash issues. The very convenient altitude adjustment knob. 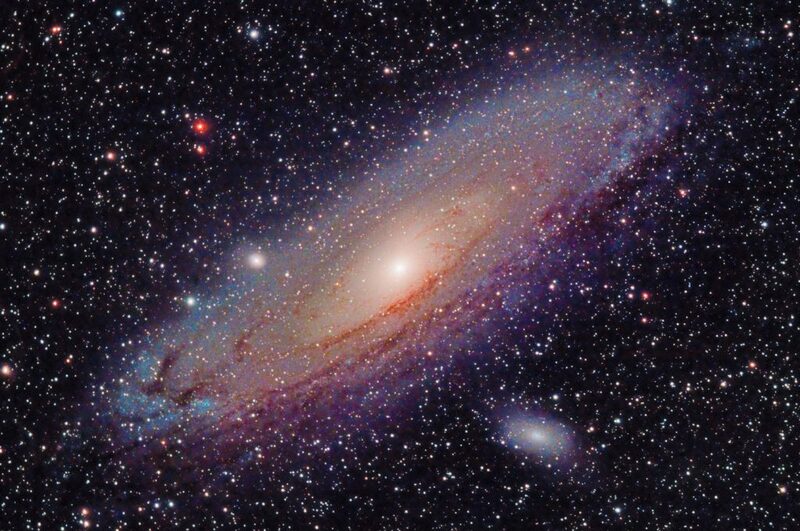 If it is not clear, this little mount was made with astrophotography in mind. The combination of the aforementioned excellent polar scope and a good servo drive system with a low periodic error seems to give excellent results even unguided. You can expect to push over 1 minute exposures with medium focal lengths (even more with short ones) with under a minute of effort with the polar scope. What’s more, the mount is very silent both when tracking and when slewing, so neighbors won’t notice you. In addition, it uses up surprisingly little power! A “standard” 17Ah car-starter/battery will power the mount for a few dozen hours of operation (meaning something like 5-7 long nights). One little disappointment is that while the mount can be trained for PEC, it will lose the data when it switches off. PPEC is a feature reserved for the more expensive iOptron mounts (starting with the iEQ30 Pro), but at least the ZEQ25 has little PE to start with. There is also one issue that comes with the “Z” design: it will stop tracking when it crosses the meridian. You can override the function to let it track more, but after half an hour or a little more the DEC motor assembly will reach the mount, so you can’t go on after that, you’ll have to let it find the target again by slewing 180 degrees in RA. This did not use to bother me in my previous house, but my current backyard has access to a N to S overhead strip of sky, so whatever I want to track will pass from the meridian, which requires some planning from my part. I talked about the impressive capacity this little mount has. 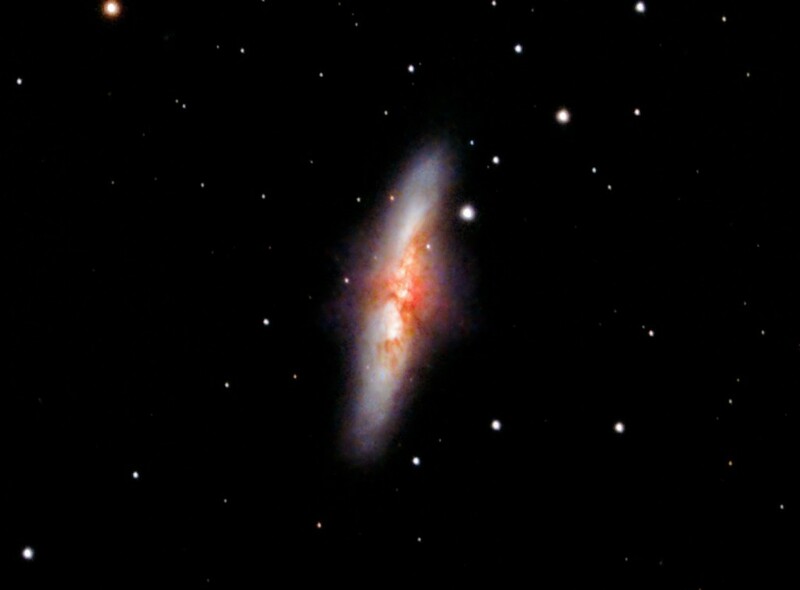 In fact, I know people successfully using it for astrophotography with 8″ Newtonians that are near the limit of the rated load, but to be frank I think that is a bit pushing it, mainly due to the length. 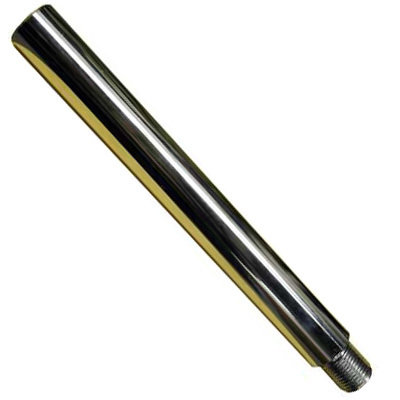 In general, I don’t recommend something longer than a 6″ f/5-f/6 Newtonian, since it starts to become very sensitive to the wind and vibration from taps does not get absorbed quickly. 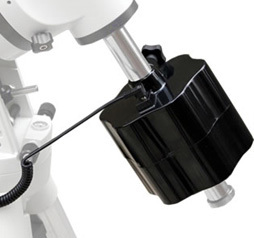 Short tube scopes like SCTs work better, for example a C8 is very comfortable while you can go longer with refractors that are 3″-4″ in aperture. As I said, it is a remarkable little mount and people often push it and it delivers. So when I got a C9.25 thinking I’d only get to use it visually with the ZEQ25, I was surprised with the results of the one deep-space session I’ve had so far (yeah, good luck getting another couple of hours of starry skies here in S. Manchester). It should be clear by now that this is not your grand-dad’s little mount. Note that I have upgraded my saddle to an ADM (still vixen-style) which adds a bit sturdiness. 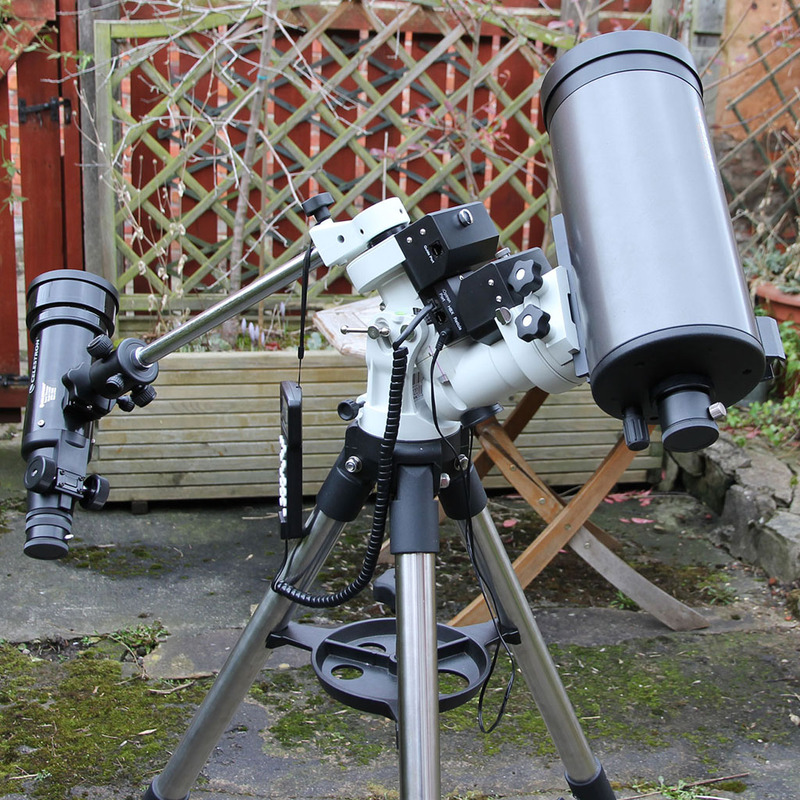 Since I own the Skywatcher HEQ5 (Orion Atlas in the other side of the Atlantic), which has been the most popular low cost small/medium-scope astrophotography mount for quite a while now (at least in Europe), it is only fair to make a direct comparison. First of all let’s get the obvious differences out of the way. The HEQ5 is cheaper (especially in Europe all iOptron mounts have a premium over their US prices) – potentially significantly cheaper as there are 2nd hand options popping up often – and much heavier. The latter fact means that it handles heavy and long scopes better, with less vibrations, however it also makes it much less portable. I have used the iOptron with an 200/1000 newtonian and the slightest breeze can give you vibrations. That kind of scope would be better with the HEQ5. As noted previously, shorter scopes, like SCTs are fine (e.g. the C8 is very comfortable) and modest refractors are great. For these kind of scopes, unless you have a permanent observatory, disassembling (at least partially since it can’t really go through doors fully assembled) and lugging-around the HEQ5 is inconvenient, and, as it turns out, unnecessary if you can afford something like the ZEQ25. There are other less obvious differences though, which probably stem from the fact that the ZEQ25 design comes over a decade after the HEQ5. For example I never miss the rather badly-engineered altitude adjustment of the HEQ5 (and EQ6) which apart from being prone to bending is also mightily inconvenient to use. The ZEQ25 has a very smooth, soft yet precise altitude adjustment. The iOptron polar scope is top-notch and while the HEQ5 finally started shipping with something comparable in 2015, it is still not at the same “level” (which I can use as a pun, as – at least until recently – it didn’t come with any sort of bubble level and it is installed at a random angle, so you have to rotate your RA to get it upright). And if you look at the pre-2015 reticle (which is still used by Celestron by the way), it is a rather sorry sight, especially if you want to use it for astrophotography (of course Polar Scope Align does try to make the most of it). So, setting up, polar aligning etc is much faster on the ZEQ25 thanks to all these differences and the controller setup is also sped up with the built-in GPS – most of the time you don’t have to input time/location. I already talked about the hand controller differences, it is mostly a matter of preference, although the automatic setting of the tracking rate depending on your goto target is a nice advantage of the ZEQ25. Both mounts are good at tracking. Each specimen is different but reports indicate that without PEC the HEQ5 has more PE (on average 20-50 arcsecs vs 12-32), while the ZEQ25 “forgets” PEC training when it is turned off. These won’t matter if you are doing guided exposures of course. Of course, for proper (i.e. not “pulse”) guiding the HEQ5 needs an extra 3rd party adapter, the eqdir, while the ZEQ25 as a more modern mount can connect directly to a PC with its ASCOM drivers with only a simple serial to usb cable (as is true with recent SkyWatcher/Orion mounts as well). A very big difference is the power consumption. The HEQ5 uses up my 17Ah battery to the point that it is close to the “recharge” line in 2-3 nights, while, as I said, the ZEQ25 can go for 5-7 nights! Looking at the specs gives us the reason, the HEQ5 uses 0.9A when tracking, which is 450% of what the ZEQ25 uses (just 0.2A). Also, both mounts are relatively self-serviceable. I had a bit of play on both when I got them and I fixed them myself. The process was quite different, the ZEQ25 had more disassembly but gave me better control of the process, while the HEQ5 was a bit more trial and error with various screws – depending on the person one or the other might appeal more. Overall, the more I use the iOptron, the more it feels like it is a mount a few generations newer than the HEQ5. This sounds heretic to some people who are of the “don’t change what works” mentality and from whom you can only pry the HEQ5 out of their cold dead hands, but imagine if those people had a mount that “worked”, before the HEQ5 came out all these years ago – would they still be stuck with that? So, if you have an OTA in its range and you can afford it, I’d say the iOptron is worth a premium. Reasons to get the HEQ5 include the extra capacity, situations where a permanent location mean the size/weight advantage cannot offset the price difference, or a great deal on a second hand HEQ5. A special mention has to be made for iOptron’s support. I have contacted iOptron 2-3 times with various questions and each time their response was prompt, knowledgable and helpful. For small issues they even send you pdf manuals if you wish to fix things yourself instead of sending the mount in (e.g. centering the polar scope). Also, I know from other owners that even their out of warranty support is good and repairs are not costly. Another helpful one is the “tune up” video. If your mount feels like it has some “play”, you can follow this tune up guide and get rid of the play to improve your tracking. I have performed this once on my own mount since after a year or two it started showing some play and indeed it tightened up nicely. It is a clever idea to combine a counterweight with a 8Ah battery. The battery would be a bit small in capacity for another mount, but it is enough for a few nights with the ZEQ25. As with all telescope-specific batteries you pay extra compared to, say, a car-starter/battery, so the budget-conscious might shy away from the convenience of a counterweight battery. Costs $158 currently. If you want to approach the 12kg max capacity of the mount, you can’t do it with just an extra 4.5kg counterweight, but you’ll have to go for the 7.25″ extension bar that screws at the end of the regular CW shaft. Costs $30 currently. See my review here for the benefits of the replacement saddle. It is a highly recommended upgrade, especially if you plan to use the ZEQ25 with relatively “heavy” OTAs. It is available in Vixen, Losmandy-D and dual configurations. The Vixen-style costs $99. An interesting little accessory, screws at the end of the CW shaft and gives you a 3/8″ male photo thread. This is something not advertised on the iOptron website, but if you ask them they can send you one ($10 + shipping) to attach something like a small scope or a ballhead with a camera etc. 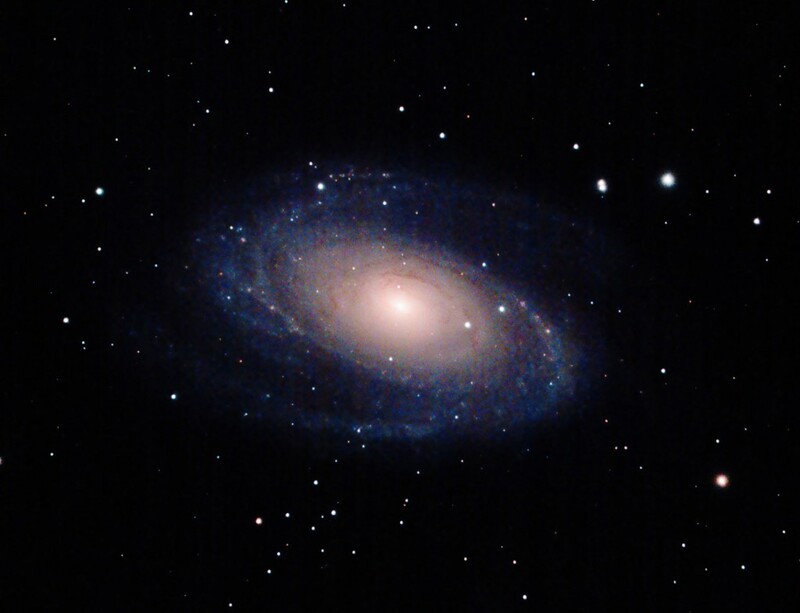 On the ZEQ25 the CW shaft does not rotate with the DEC axis, so this is not good for guided piggyback astrophotography, but for unguided it is fine. The ZEQ25 is a mount that I highly recommend. 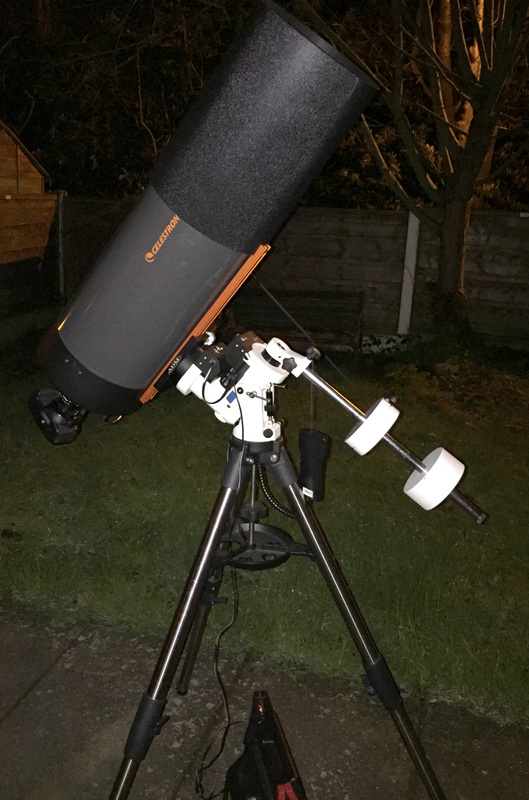 It is not perfect of course and mine required some relatively easy tuning (centering the polar scope, adjusting RA play) and a nice upgrade (the ADM saddle) to get it to where it is now, but in my experience that is common for a mount, at least at this price point. Especially if you value portability I am not aware of a mount that has a similar lift/weight ratio and at the same time it performs great for visual and astrophotography. The price is not bad either (especially if you are in the US) – everything you need is included, as well as things that are optional or not available for other mounts (GPS, illuminated polar scope, AC adapter…). Note that at the start of 2016 the ZEQ25 is being replaced by the CEM25 which is the same mechanically (upgraded electronics), so most of the review should apply to it as well. In fact, since the ZEQ25 is currently on sale due to the introduction of the CEM25 ($799 from iOptron), it might be a great deal. The biggest difference of the CEM25 is that it uses stepper motors which removes the over-current issue that some ZEQ25 users encounter. As I have never encountered such an issue myself even with very unbalanced loads, I can’t say if it really is a problem. Amazing portability and lift/weight ratio. 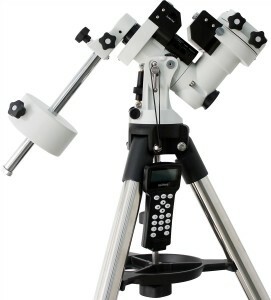 Superb polar-scope & alt-az controls. Full-featured hand-control & GPS included. Good tracking even when approaching capacity limit. Great manufacturer support, but also quite self-serviceable. Saddle could be better. The ADM upgrade is certainly worth it. The “Z” mount design has the disadvantage that tracking cannot continue long after you cross the meridian. PEC is not permanent (lost when switching off). The reason of course is to better justify the more expensive price of the iEQ 30 Pro. HC button responsiveness, GPS “lock” time and polar scope factory-alignment are some small complaints. The review is very helpful. 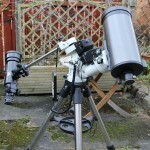 I an considering the mount for a 150mm F8 ED refractor at 23.5lb. It will be a push, but may be OK for backyard visual work. Thanks for the comment. Hmm, as I note in the review, it does well “pushed” a bit to the limit, but mostly for short OTAs like SCTs. Such a light mount doesn’t have a lot of rotational inertia (due to physics), so a heavy OTA that is also long might give it trouble, especially since it will act like a sail when there is some wind. Now, if the max you want to carry mount-wise is the ZEQ25/CEM25 there is nothing at this level of portability that will carry more and you might compromise with the vibration etc that will come with such an OTA (in visual at least). However, if you don’t mind carrying about 5-6 lbs more, perhaps you should look at the iEQ30, or the Orion Sirius Pro (Skywatcher AZ-EQ5 in europe). 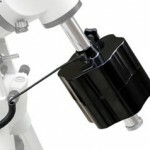 I haven’t actually used them, but I would guess a bit more weight on the mount head would help stabilizing a long OTA. What were the guided tracking rates? What were the percentages of frames dropped? Those figures are what a comparative review should have boiled down to. As an aside, I wouldn’t consider the IOptron without the heavier tripod. Hi. 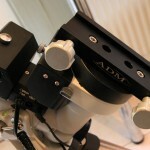 You’ll notice that I do mention that I had to drop 30% of the 1m frames with the heavy C9.25. With light scopes with which this mount excels you hardly drop any frames (and with guiding I think I’ve never dropped any that were due to the mount). I would personally not consider it with the heavier tripod as it would lose a lot of its amazing portability. If I wanted to lift heavy OTAs more effectively I would simply go to a heavier mount – but that’s just me. Admittedly I did not write much about guided performance of the mount since I was primarily using it unguided at the time I did the write-up, but with a small refractor it did show excellent behaviour staying always below 1 arcsec RMS at both RA and DEC (interestingly the newer CEM25 I use now is a bit worse at DEC, although I don’t see a problem in frames so I have not investigated). Thanks for this very helpful review. I’m considering the new version, the CEM25, but I run into a lot of people who are adamant that you can’t get a decent photo on anything less than a 35 pound mount–plus a 35 pound tripod! From your experience, it sounds to me like my Tele-Vue NP101is should do just fine on this. And if I do get a CEM25, your advice about the tweaks and the ADM saddle will be the first things I look into. 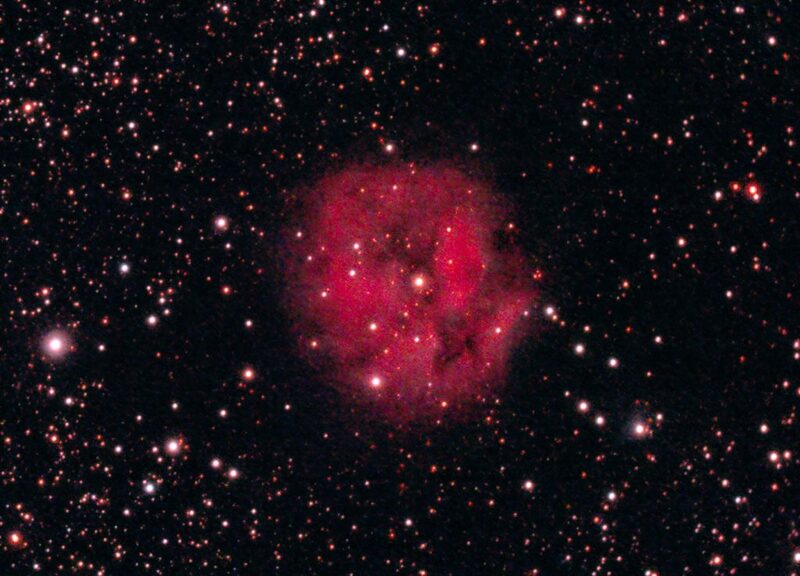 Thanks again for going to the effort to post this thorough review, and best of luck to you with your astrophotography.